Oh the doldrums of winter have been broken by this bright and flavorful salad. The ingredients were sourced locally from a grocer that maintains hoop houses throughout the winter. This allows us to have beautiful micro greens on which to place our gorgeous Chioggia Beets, and dug out of the ground that day Carrots (I watched them do this – so I know it’s true!). According to my Baker Creek Heirloom Seed catalog the Chioggia beet is: A pre-1840 Italian heirloom beet, this variety arrived in the USA prior to 1865. They have light red skin and beautiful rings inside, like red and white candy stripes. The flesh is very tender, mild, and sweet. Named after a fishing town in Italy. I was lucky enough to spend a few days in San Diego where I was reminded how easy it use to be to find fantastic produce. I have to look a little further nowadays but it is truly worth the effort and cost. Our grocery budget is by far our biggest expense. That’s ok. I’d rather spend more on real food than less on the fake stuff. In a small bowl combine all dressing ingredients, stir, set aside. 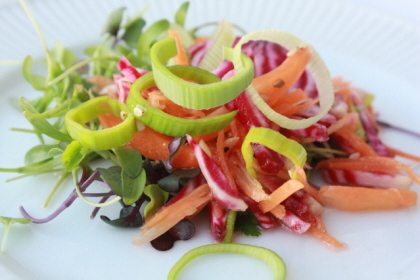 On two small plates equally divide micro greens, beets, and carrots. Then dress the salads to your liking and enjoy!